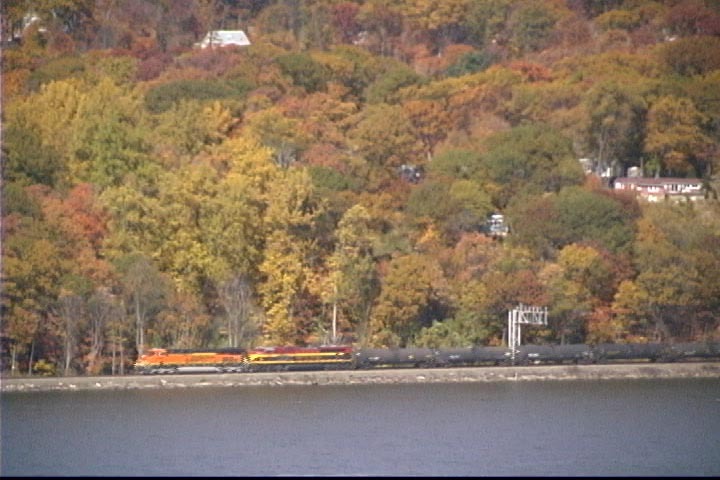 As if there wasn’t ENOUGH color at Bear Mountain that weekend, southbound manifest Q433 added even more color to the scene, sporting a BNSF Heritage III ES40DC and a KCS SD70ACe in the new Southern Belle livery, as it headed south down the River Line at Fort Montgomery, NY on the second day of Novemeber. This was my first Belle catch, and with a pumpkin ahead and peak fall color behind, I’ll say my first Belle wasn’t too bad at ALL! Shot on CSX’s River Subdivision on 11/2/08 by Mike Antal.